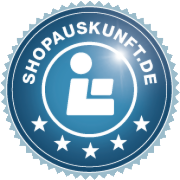 Vinool was awarded the ShopAuskunft.de seal for entirely positive customer reviews in 2016. We appreciate the feedback of our customers. Read our customers' reviews on Germany's large online shop review site ShopAuskunft.de.